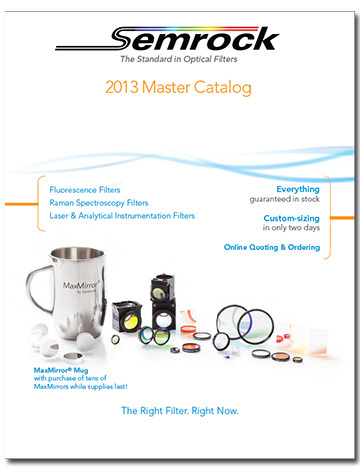 Rochester, NY, Semrock, Inc. has announced the release of the 2013 Master Catalog. The new 116-page, full-color, catalog of optical filters and related products, contains new Technical and Product Notes along with a large selection of new products recently introduced. With this printing Semrock has introduced over 30 new thin-film filters for fluorescence microscopy and measurements, Raman spectroscopy, and other laser analytical instrumentation applications. Among the standouts of this print edition is the expansion of the EdgeBasic™ product family. These long-pass edge filters are designed to provide deep blocking at the laser wavelength at a value price, and now cover 23 laser wavelengths. The catalog also contains a Product Note explaining how Semrock has developed a demonstration system, called "Fresco," to showcase our unique, patent-pending VersaChrome tunable filter capability. This system can serve as a starting point to help our customers integrate VersaChrome filters into their systems. The PulseLine™ product family is specifically designed for femtosecond pulsed laser applications, and we now offer a line of low-dispersion beamsplitters with four different splitting ratios and for either s- or p-polarized light. These beamsplitters, similar to our high reflectivity mirrors previously released, operate over the tuning range of a Ti:S ultrafast laser (650 – 1100nm). In addition to these products, Precision Photonics’ high energy prism polarizer & high-energy dispersion-free laser mirror are also made available through Semrock for same day delivery from stock.